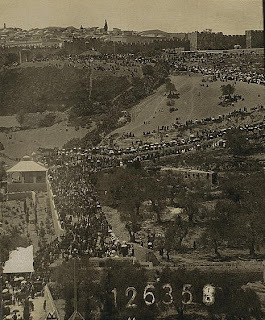 in the city at Passover time (1911)"
Today as well, Jews from all over the world and from all over Israel make their pilgrimages to the holy city. Cover of the "Temple Haggadah"
at that point, and all men are leaning to their left as prescribed. The Library of Congress photographic collection includes the 100-year-old picture of the "throngs" visiting Jerusalem. 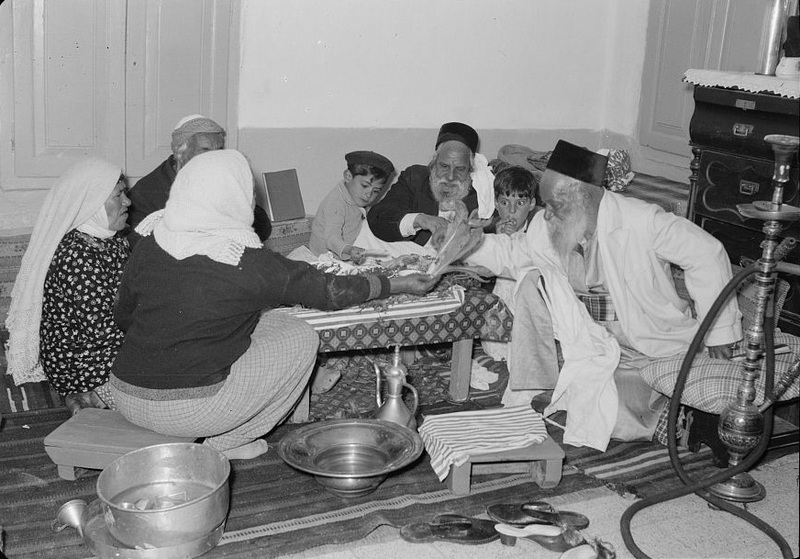 The collection also contains a series of photographs of Yemenite residents of Jerusalem celebrating their Passover seder in 1939. Note their low table and compare it to the painting of a Seder during the time of the Temple, taken from the Passover Seder Haggadah of the Temple Institute in Jerusalem. The Yemenite community has a tradition of a soft matza, similar to Middle East pita or laffa bread, which they bake daily during Passover. 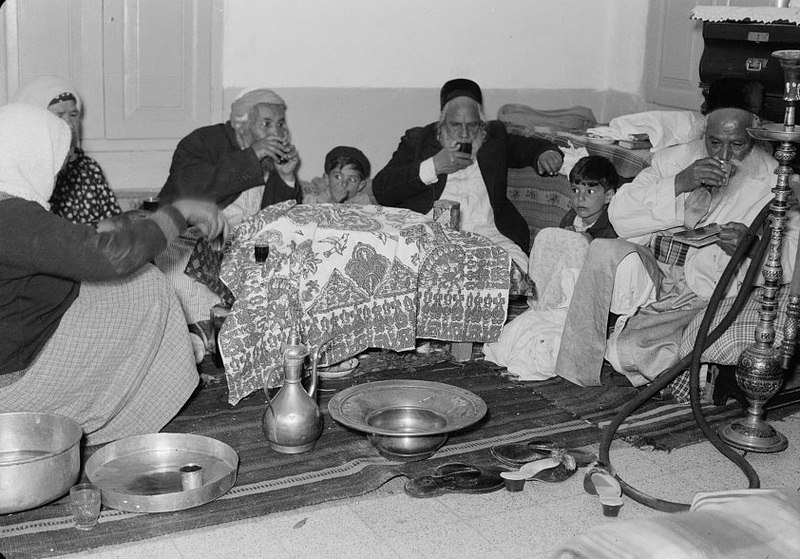 Discussing the local matza, an ancient traveler to Tza'ana in Yemen quoted his Yemenite host, "There is no requirement that the matzos be dry and stale because they were baked many days before Pesach. Every day we eat warm, fresh matza. " The traveler reported, "I enjoyed their special kind of matza -- it was warm, soft and didn't have the usual burnt sections which was present in every matza I had ever eaten until then." 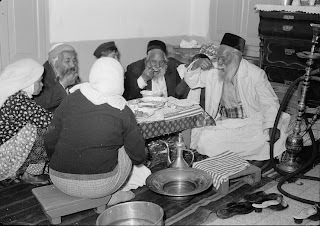 Unfortunately for the 1939 Yemenite family, it appears that the only matza available to them was the square and stale machine-made matza. It's nice to see a simple seder where the food is not extravagant and lavish. I for one would love to return to a simpler way of celebrating Passover with an emphasis on meaning and less on over-indulging..I think the entire preparation for the modern day seder is what makes the woman of the house crazy with the cleaning and the feeling that one has to live up to a standard one is not used to. These pics are great. 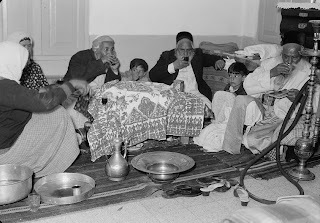 I especially love the hookah in the pics. Our family has 3 hookahs and we are the only Jewish family we know in the community to use them. 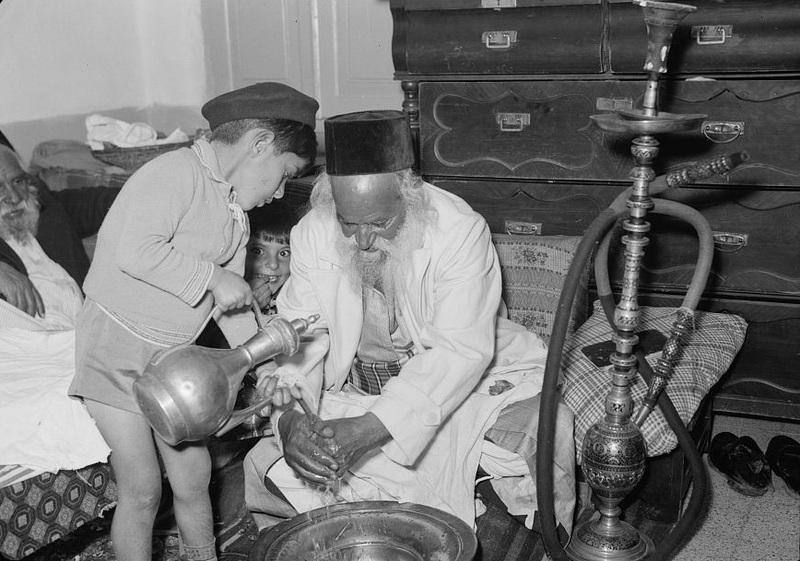 Most Jews here are Ashkenazi so they have no idea what a hookah is. Great blog. I will frequent here often.